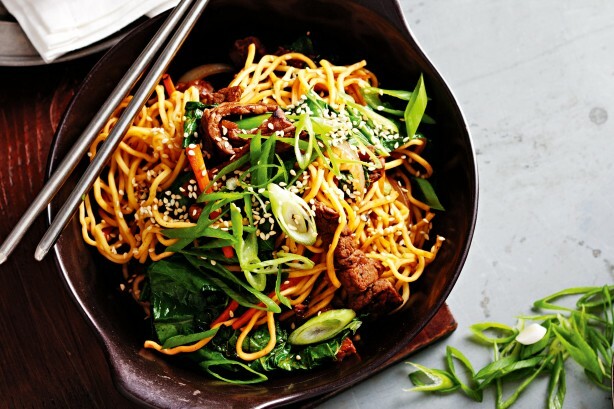 This ticks our top Chinese flavours for beef: hoisin, five spice, ginger, garlic and sesame. A pack of fresh chow mein noodles is the secret to this quick and tasty crowd-pleaser. Combine hoisin sauce, sherry and Chinese five spice in a jug. Transfer half to a bowl. Add beef to bowl and toss to combine. Marinate for 5 minutes. Prepare noodles following packet directions. Drain. Heat a large wok over high heat. Add half the oil. Stir-fry the beef, in 3 batches, for 2 minutes or until browned. Transfer to a plate. Wipe wok clean with paper towel. Heat remaining oil over high heat. Stir-fry onion for 2 minutes or until slightly charred. Add carrot, gai lan stems, ginger and garlic. Stir-fry for 2 minutes or until tender crisp. Add the gai lan leaves. Stir-fry for 1 minute or until just wilted. Add the beef, noodles and remaining hoisin sauce mixture. Stir-fry for 1 minute or until heated through. Divide among bowls. Top with spring onion and sesame seeds. Note : To make this meal for vegetarians, substitute the beef with thickly sliced firm tofu.